Former University System of Maryland Chancellor William "Brit" Kirwan, chairman of the Commission on Innovation and Excellence in Education, advocates at a press conference in Annapolis for legislation reflecting his commission's recommendations. The state Senate gave preliminary approval Tuesday to a bill that aims to reshape the way Maryland approaches public education. The bill came out of recommendations by the Commission on Innovation and Excellence in Education, better known as the Kirwan Commission. 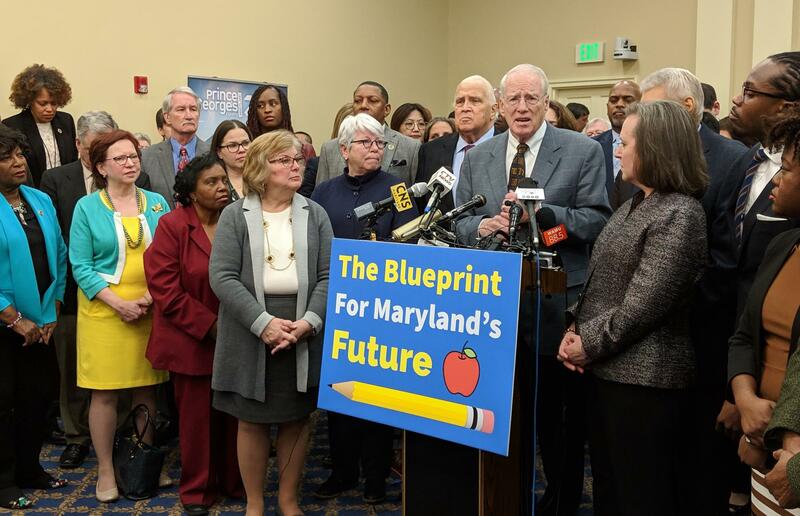 It’s named, “The Education Blueprint for Maryland’s Future,” and it’s meant to be that — a blueprint. Or as Senate Education, Health and Environmental Affairs Committee Chairman Paul Pinsky put it, it’s a “down payment” on a 10-year plan. “So essentially, if we pass this bill and stay on course, it will be 11 years out ‘til we fully implement it with the cost and all the recommendations,” he told the Senate Tuesday. The bill expands full-day prekindergarten, raises teacher pay, and for schools with high levels of poverty, it creates grants to hire on-site health care providers, among other things. Although lawmakers have allocated more than $200 million for the first year, they don’t have a plan for how to pay for future years. At the end of the 10-year phase-in, the price tag is more than $3 billion dollars annually. A long-awaited report by the Commission on Innovation and Excellence in Education — better known as the Kirwan Commission — recommends full-day preschool for all low-income 3 and 4-year-olds, higher academic standards, more training for teachers and raising teacher pay. And it proposes creating an “independent oversight board” to ensure that the new policies, once they are approved, are properly implemented. The report, released Thursday, recommends rolling out the changes over the next decade. Four Democratic candidates for governor and three for lieutenant governor discussed education policy at a forum Tuesday night hosted by the Real News Network in Baltimore. The forum’s focus was the state panel studying how to revise Maryland’s education funding formulas and modernize the state’s approach to education more broadly. The group is known as the Kirwan Commission because it’s led by University System of Maryland Chancellor Emeritus Brit Kirwan. It plans to publish its recommendations at the end of the year, and they are expected to come with a large price tag.